Heavy-duty ALPOLIC®/HD heavy duty panels are the strongest, most rigid aluminum composite materials we offer - providing superior tensile and yield strength with over five times the flexural elasticity strength of our standard panels. These heavy duty panels incorporate skins of 0.032" aluminum sheet metal - 60 percent thicker than our standard aluminum skins. And they're available with the same advanced Lumiflon® FEVE resin coatings, in Valflon® finishes supplied by Valspar, that make ALPOLIC® panels the most beautiful and durable aluminum composite materials you can specify. ALPOLIC®/HD panels are custom-manufactured to your order, so be aware that additional lead time is required and minimum order requirements may apply. These panels are typically produced in 4mm or 6mm thickness, in widths of 50" or 62" and in lengths of 146" or 196". Because they're custom-manufactured, other widths, lengths and thicknesses can be produced - please contact Customer Service to discuss your needs. 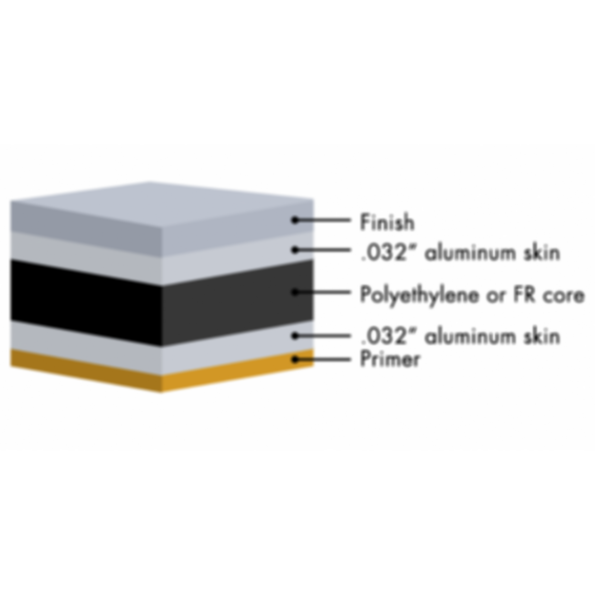 All our painted finish options are available, including solid colors; metallic, mica, prismatic and multi-color finishes; stone and timber effects; decorative metal finishes; natural metals; and anodized aluminum.